Words to adequately describe the string of superlative skiing days in Boonville this year are hard to come by. They were better than any four consecutive ski days in memory. 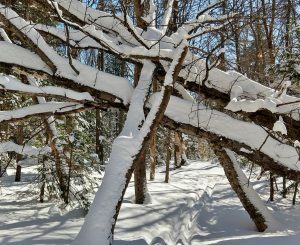 Temperatures hovered in the teens to low twenties with an inch or two of fresh snow each evening, just enough to freshen up the trails. True, we had some windy days but the wooded venues mostly shielded us. 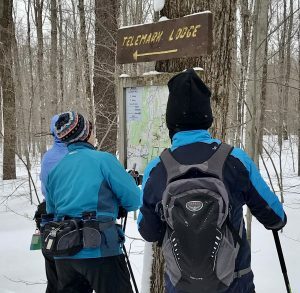 Tuesday, arrival day, found several participants at North Country Manor early in the afternoon and we opted for a short ski on BREIA’s Jackson Hill trails. 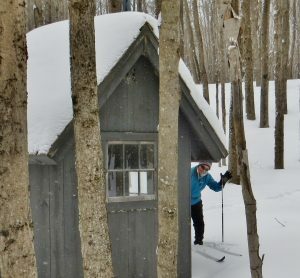 Conditions were perfect and we skied the four mile “Hillside / Adirondack Field / Into the Woods” loop. We were elated! Wednesday dawned pretty cold and windy so we opted to wait until 10:00 to venture out. We had our sights set on our long-time favorite, ungroomed trails of Carpenter Road. We were not disappointed! It had been a few days since the trails had been skied so there was some modest trail breaking to be done. But we were rewarded with beautiful snow conditions and scenery that included lots of snow-draped conifers. Most of us skied the main trails in the system. 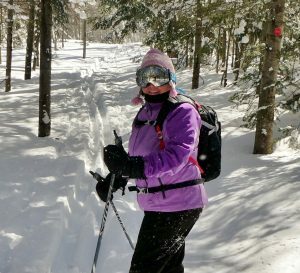 Others chose a shorter series of those trails and opted for an afternoon ski at our newly rediscovered trails at Adirondack Woodcraft Camps. These mostly single-track, easy, groomed trails wind nearly five miles through the scenic woods on the property of a children’s summer camp. 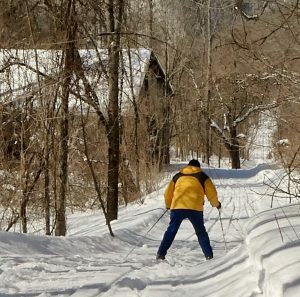 On Thursday, most of us decided to ski the upper trails in BREIA’s Egypt Road system. 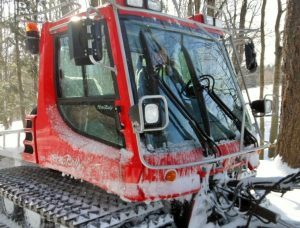 Again, a couple of inches of fresh fluffy snow blanketed the recently groomed trails and the skiing was a delight. We even managed to ski down the Gully IV trail with no mishaps so we could enjoy the Creek View Trail. Finally, many in the group skied one-way down the Link Trail to the lower parking area. And, to remain in the one-way theme, a few members skied down the Hillside Trail to the Canal Trail. 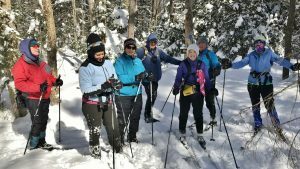 Others in the group opted to ski a section of the groomed Steam Mill Road Trail near Brantingham Lake. On our final full day in the area we again split into two groups. 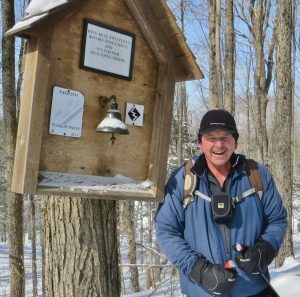 One returned to the Jackson Hill Trails where we added the Barkeater Loop, the Telemark Trail and the Serpentine Loop, finishing with a repeat down the Hillside Trail. The other group first skied a portion of the BREIA Canal Trail and finished with the main loop at Jackson Hill. All had a fabulous day! I would be remiss to neglect our meals. Each morning began, of course, with one of host Craig’s patented breakfasts. Our first evening meal consisted of leftovers from the Inlet Trip. We patronized the Steak & Brew Restaurant the following evening where a few of us couldn’t resist the tableside preparations of Caesar Salad and Bananas Foster. We served up Bill’s “Meals from Cans Autumn Chili” the next night and, finally, finished off with a pizza and leftovers night. All the meals were supplemented with a salad and Jesse and Karen’s homemade apple pie and applesauce. Thanks, too, to members who donated appetizers, especially the copious quantities of steamed shrimp from Karen & Jesse! 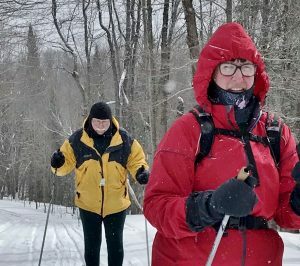 A few of us finished the trip off with a ski around the Westwind Loop at Highland Forest where conditions, while not quite up to Boonville standards, were very good, indeed. The 2019 Boonville Trip is now a treasured memory; a perfect end to an excellent Kick ‘n Gliders ski season!